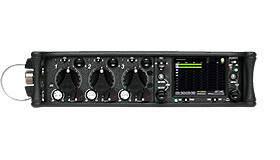 The 664 Field Production Mixer is the new flagship in Sound Devices’ line of portable audio mixers. 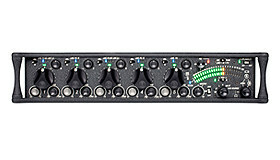 Building on the foundation of the popular 552 mixer, the intuitive 664 has six inputs channels and four output buses. All inputs and outputs are recordable to both CF and SD cards. 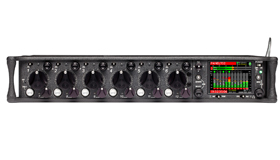 This unprecedented amount of I/O connectivity and recording capability makes the 664 perfect for any production application. high-pass filters, input trim controls, and direct outputs. Input connectors 1 and 6 can be selected to accept AES42 or AES3 digital signals. All six direct outs can be individually switched to become additional balanced Line level inputs. In complex, multi-camera productions, output flexibility is essential. 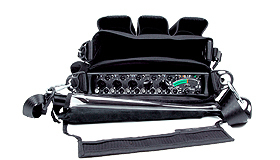 The 664 can send its main left/right outputs to three cameras simultaneously. Two additional output buses, X1 and X2, appear on balanced TA3 connectors. 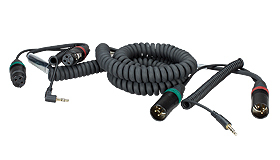 AES3 digital outputs are individually selected to appear on the main XLR and multi-pin output connectors. The 664 can record each of its inputs and its four output buses, for 10 record tracks. Recordings are saved to CompactFlash and SD cards. Recordings are either 16- or 24-bit Broadcast WAV files with extensive metadata. All popular production sampling rates are supported. 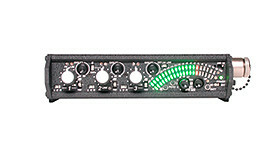 When used with a CL-6 Input Expander, the 664 records 16 tracks, 12 inputs and four output buses. 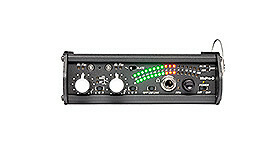 MWith the mixer’s built-in, rock-steady Ambient time code generator, multiple devices can operate in synchronization. The 664 operates as either a timecode master clock or its clock can be jammed from external time code. A helpful time code compare utility shows the difference between internal and external time code. 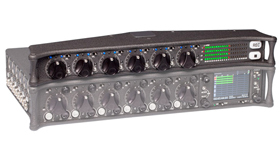 The 664 was designed with knowledge gained from the industry’s top engineers and from Sound Devices’ expertise in portable mixers. 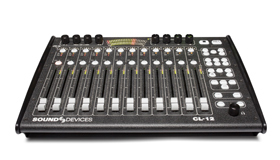 Because sound engineers operate in fast-paced environments, important controls are on dedicated knobs and switches, while additional features are quickly accessed through the intuitive LCD-based menu control. Affects analog output. Threshold selectable from +4 dBu to +20 dBu, 1 dB steps, 20:1 limiting ratio, 1 mS attack time, 500 mS release time. External: isolated 10-18 V on locking 4-pin Hirose connector, pin-4 = (+), pin-1 = (-). Dimensions: 5.3 cm x 32 cm x 19.8 cm (H x W x D) 2.1" x 12.6" x 7.8"